For other uses, see Kokoshnik (architecture). The kokoshnik (Russian: коко́шник, IPA: [kɐˈkoʂnʲɪk]) is a traditional Russian headdress worn by women and girls to accompany the sarafan, primarily worn in the northern regions of Russia in the 16th to 19th centuries. Historically a kokoshnik is a headdress worn by married women, though maidens wore a headdress very similar to a kokoshnik, but open in the back, named a povyazka. The word kokoshnik describes a great variety of headdresses worn throughout Russia, including the cylindrical hats of Veliky Novgorod, two-pointed nimbus kika of Vladimir, triangular kika of Kostroma, small pearl hats of Kargopol, and scarlet kokoshniks of Moscow. While in the past kokoshnik styles varied greatly, currently a kokoshnik is generally associated with a tall, nimbus or crest shaped headdress which is tied at the back of the head with long thick ribbons in a large bow. The crest can be embroidered with pearls and goldwork or simple applique, usually using plant and flower motifs. The forehead area is frequently decorated with pearl netting. While wearing a kokoshnik the woman usually wears her hair in a plait. It resembles the French hood worn in Tudor England, but without the black veil. Grand Duchess Xenia Alexandrovna of Russia (left) and Natalie Portman as the Star Wars character Padmé Amidala wearing the Travel Gown (right), inspired by Russian fashion. The word kokoshnik first appears in 16th-century documents, and comes from the Old Slavic kokosh, which means a hen or a cockerel. However, the earliest head-dress pieces of the similar type (rigid cylindrical hat which completely covered the hair) have been found in the 10th- to 12th-century burials in Veliky Novgorod. The kokoshnik gave its name to the decorative corbel arch that became a distinctive element of traditional Russian architecture from 16th century onwards (see kokoshnik in architecture). During the revival of Russian national culture in the early 19th century, diadem-shaped tiaras became part of the official court dress for royalty and for ladies-in-waiting. These "kokoshniks" were inspired just as much by Italian Renaissance fashions and by the french hood as by the authentic Russian kokoshniks still worn by the middle class and wealthy peasants of the time. In this period both unmarried and married women wore the variety used traditionally by unmarried women: showing the front part of the hair, and with a translucent veil falling down the back. Russian peasant girls and women wore kokoshniks on special occasions until the Russian Revolution. After the Revolution Russian émigrés introduced the kokoshnik to the rest of European fashion. The style had appeared once in the 1893 wedding head-dress of Mary of Teck, the future Queen consort of the United Kingdom. As of 2014 kokoshniks are worn chiefly by girls and women in Russian folk ensembles. A kokoshnik is also a part of the traditional costume of Snegurochka, the granddaughter and assistant of Ded Moroz. 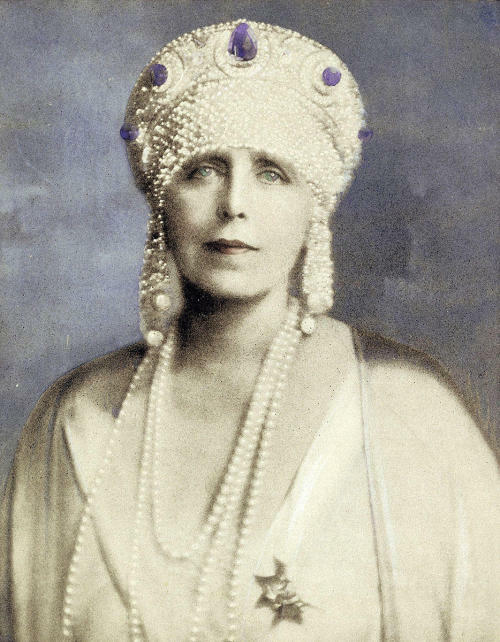 Queen Marie of Romania wore a Cartier tiara created to resemble the Russian kokoshnik for her 1924 portrait painted by Philip de László. The tiara was among the jewels on display in the "Cartier: Style and History" exhibition at the Grand Palais in Paris from December 4 through February 16, 2014. One of the costumes of Senator Padmé Amidala in the Star Wars saga, the Gold Travel Costume, was based on the Russian national costume with kokoshnik, known in the rest of Europe from the photographs taken during 1903 Ball in the Winter Palace. ↑ Kirichenko, Evgenii︠a︡ Ivanovna (1991). The Russian Style. London: Laurence King. p. 51. ISBN 9781856690041. ↑ "Obiectul Lunii Ianuarie 2014 – Portretul Reginei Maria - Muzeul National Peles". Archived from the original on 17 August 2014. ↑ "The Padawan's Guide". www.padawansguide.com. ↑ "At World Cup, foreign fans adopt traditional Russian headdress". www.reuters.com/article/us-soccer-worldcup-kokoshnik/at-world-cup-foreign-fans-adopt-traditional-russian-headdress-idUSKBN1JX0PD.